​Look who got his AKC Tracking Dog title. You can teach an old dog new tricks! Jetty will be 11 next month. He made it on his second attempt, the first attempt being completely foiled by having to run through a woodchuck colony. That was so much more fun to track then human scent! (Below) Winter tracking on "versatile surface" track. 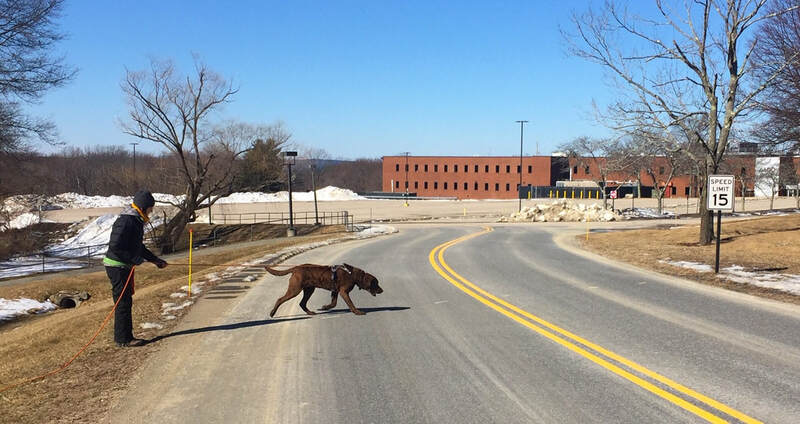 Jetty is learning to track human scent across pavement. He is right on the line that the tracker laid and marked with chalk. The track was 2 hrs. old. scores and was always the fastest. Jetty earned a JH at 8 1/2 months. 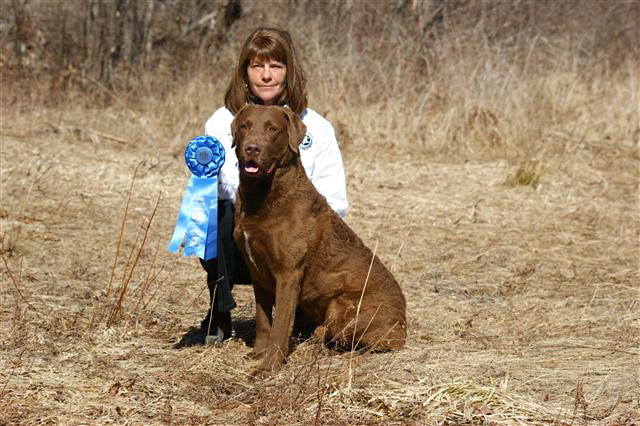 At 9 months he won second place in the Senior Puppy American Chesapeake Club Field Trial Specialty. 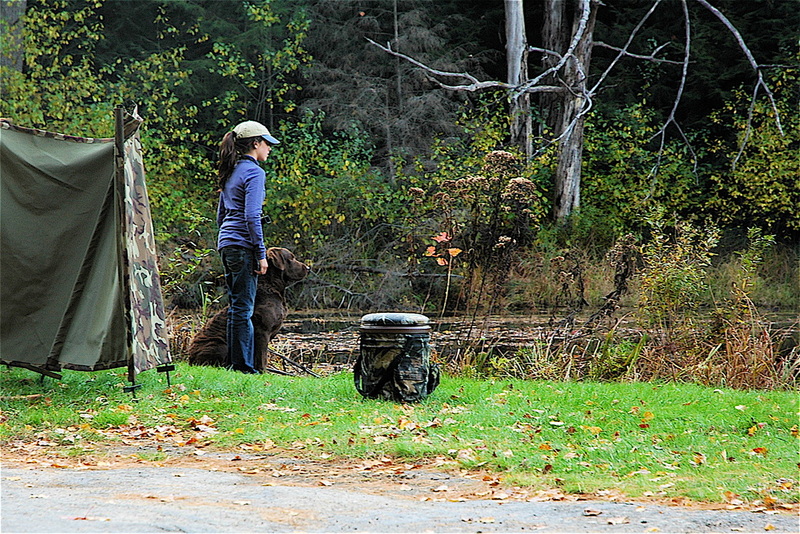 At 20 months of Age Jetty completed his AKC Senior Hunter title in four consecutive events. In September 2014 he finished his Master Hunter title. He did not need a handle on any of the marks. The judge said after the first series that his work was the best they had seen. He is a handsome, big Chesapeake who loves people and is gentle. 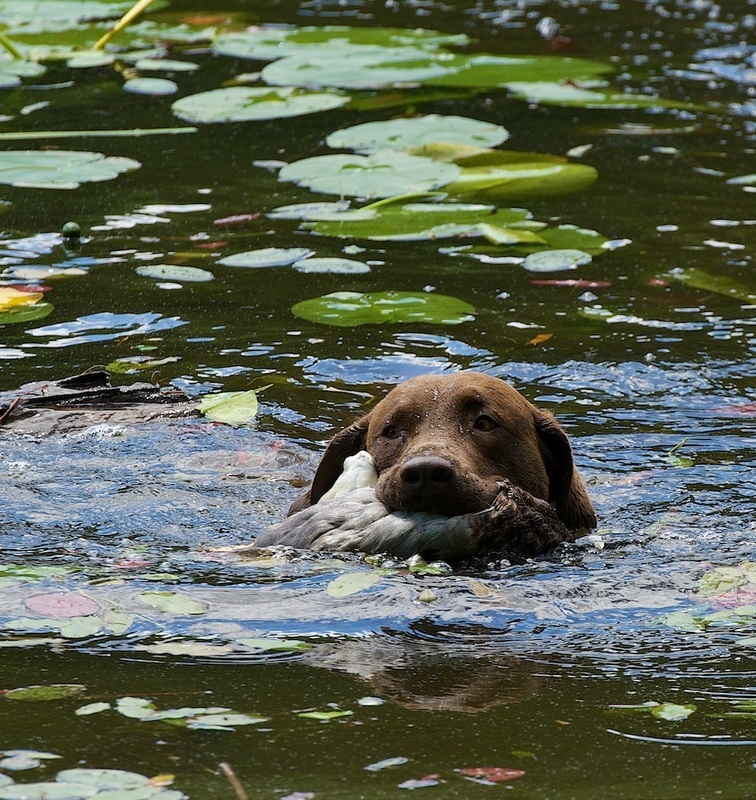 He will share the duck boat with another male and is a wonderful dog to just have "around". 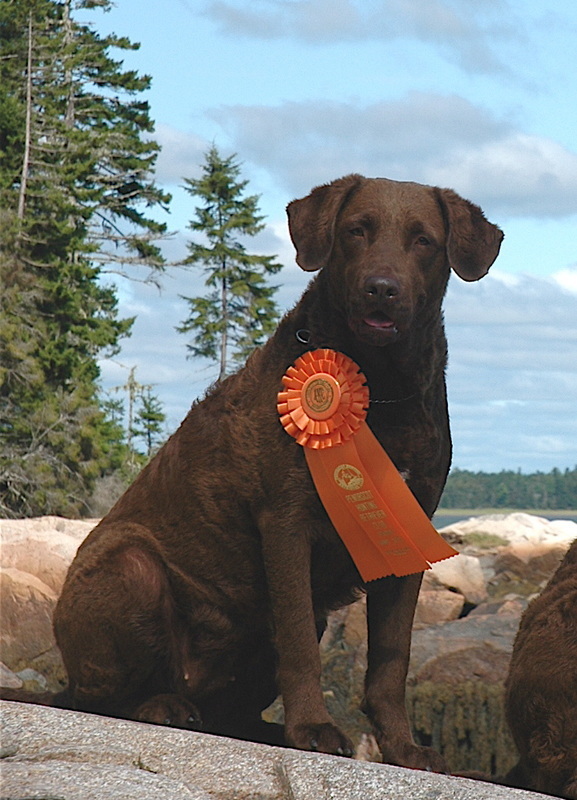 Although he was not shown, his dam, CH Sugar Tree's Tiller SH, had 6 Best of Breed wins in one summer. Jetty going through the waterlilies. 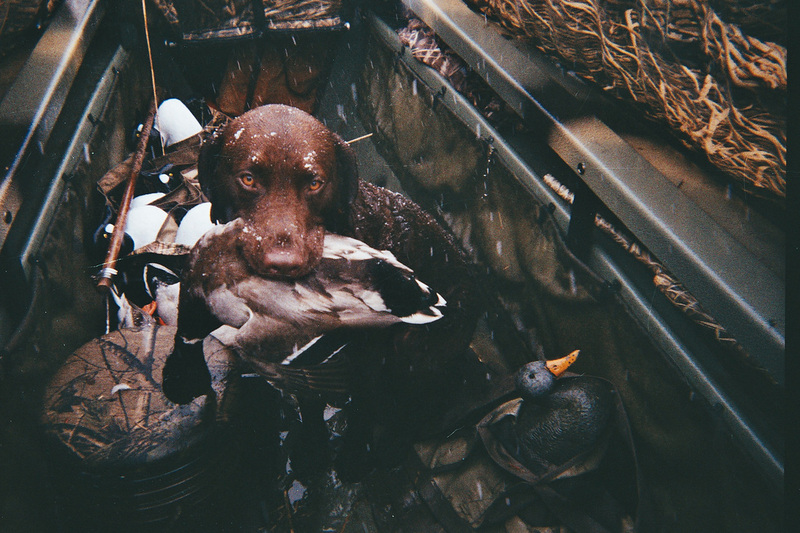 EDDY in Kansas on his first day with Bill Suenram, Big Dog Outfitters. 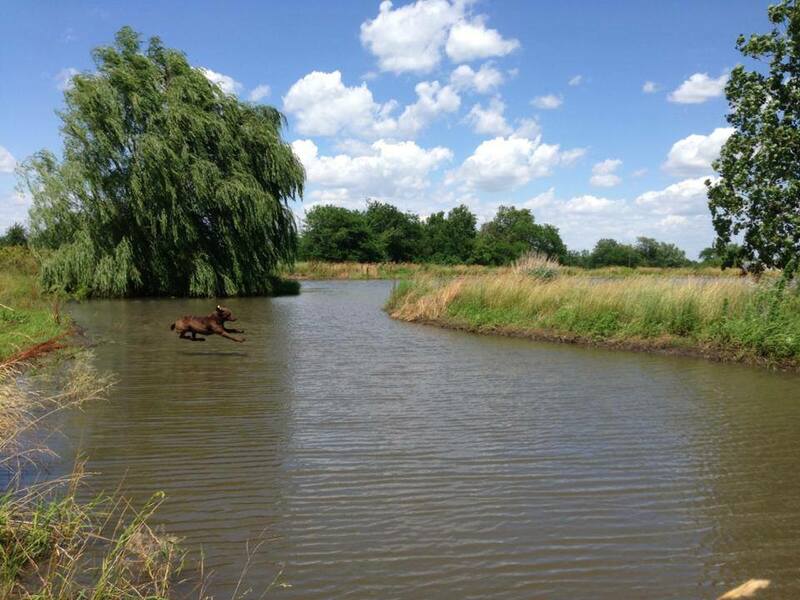 Bosun makes a happy landing in Iowa….2013. 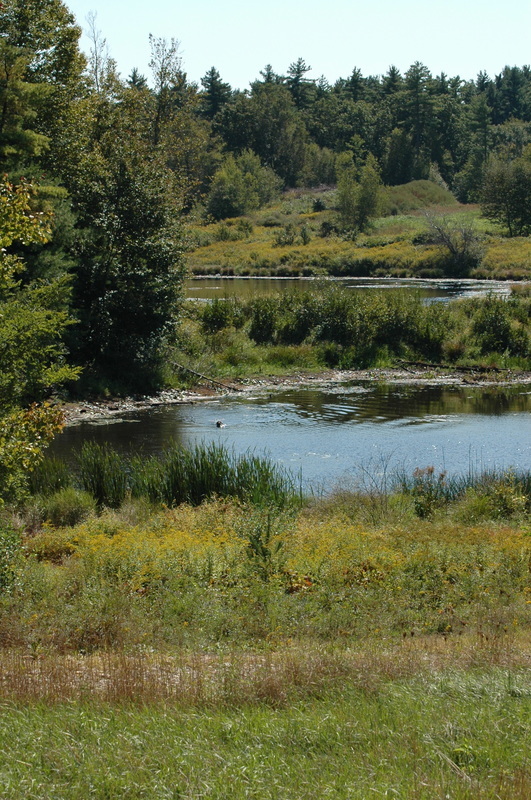 Bosun loved every person he ever met. Ch Sugar Tree’s Moose Pond Gunner MH*** (Gunner) (CH Chestnut Hill’s Tug’s Dory CD WD x CH Westwind Abernaki Chief***MH) winning Palmetto Qualifying All Age 2009 with trainer Lois Munroe.